Abstract: The objective of this case report is to explore the use of chiropractic and chiropractors as a primary spine care specialty and the efficacy of early referral to a properly trained and credentialed chiropractor. Diagnostic studies included physical examination, radiographic examinations, cervical, thoracic, and lumbar spine MRI studies and brain MRI study. Treatments included non-surgical axial decompression and low-level laser treatments. Once a clinical examination and diagnosis was formed, a favorable prognosis was expected. With appropriate chiropractic management, the outcome proved excellent in pain reduction and had minimal effect on the numbness and weakness of the patient’s left upper and lower extremities. Key Words: Disc herniation, syringomyelia, multiple sclerosis, disc bulge, demyelination. Introduction: On 8/23/2017, a 49-year-old female presented for examination and treatment of chronic left sided lumbar spine pain that began on 8/1/1983 after a slip and fall incident. The pain was described as sharp, burning, and deep with radiation into the back of the left leg with an 8 out of 10 on the VAS (visual analog scale) scale, worsening since its onset. Other Presenting Concerns: The patient also presented with sub-acute chest pain with radiation into the left upper arm. She described the pain as 8 out of 10 and has stayed the same since 7/1/2017 and is of unknown origin. The patient also reported numbness and tingling of the left lower extremity since 7/1/2017 of unknown origin. The final reported complaint was numbness and tingling of the left lower arm since 7/1/2017 that seems to start in the left upper back and shoulder and travels to the left lower arm rated at 8/10 on the VAS scale. The reported symptoms have made sleeping and staying asleep, bending over, using a computer, and concentrating very difficult. Prior Treatments: Medical care including orthopedic specialist, neurology with prescription medications, chiropractic care, and physical therapy. Past Medical History: The patient’s past history includes use of prescription and over the counter medications. Surgical history includes tonsils and adenoids in 2008, wisdom tooth extraction in 1990, partial hysterectomy in 2002 and C-section in 1998. The family health history includes Alzheimer’s disease, anemia, arthritis, diabetes, heart disease, and high blood pressure. Clinical Findings: The patient presents as a 49-year-old female of average build, clean and neat and well groomed. The vitals are: Height: 61 inches, Weight: 168 lbs, Pulse: 74 bpm, BP: 168/117 mm/Hg in left arm. The patient’s appearance is visibly uncomfortable and restless. Physical Findings: Palpation of the paraspinal musculature revealed moderate to severe spasms on the left neck, upper thoracic, and lumbosacral regions. Orthopedic testing produced pain and dizziness with foraminal compression. Upper thoracic pain with Soto Hall’s test and Sternal compression produced pain on the left anterior chest. Percussion test produced pain in the upper thoracic spine. Neurologic Testing: Diminished right patella reflex and 3/5 weakness of the left deltoid muscle group and left hamstring muscle group with hypersensitivity to light touch along the C6, C8, T1, L3, L4 and L5 dermatomes were the only positive neurologic findings. All other tests are within normal limits. Digital muscle testing was ordered following up on the initial manual findings of muscle weakness. The results were profound left sided deficits in the upper and lower extremities; deltoids 35% weaker than right side, left biceps 68% weaker than right, left triceps 26% weaker than right, wrist extensors 47% weaker than right. The left hamstring group was 25% weaker than right, left quadriceps 40% weaker than right, left anterior tibialis 44% weaker than right. Radiographic Findings: I personally reviewed cervical spine and thoracic spine x-rays taken on 8/14/17 and found the following: A severe loss of the cervical lordosis, translation of C3 on C4, C4 on C5 in extension. T3 is laterally flexed on T4 with body rotations to the left of T3, T4, and T5. A bifid spinous is noted of C6. Mild posterior osteophyte is noted on C3 and C4. Lumbar x-rays taken on 8/23/2017 revealed pelvic unleveling with right inferiority, anteriority of L5 on S1, an inferior Schmoral’s node on L5 and mild demineralization, disc degeneration and joint degeneration of the lumbar spine. Moderate to severe foraminal encroachment of L4/L5, L5/S1 is noted. 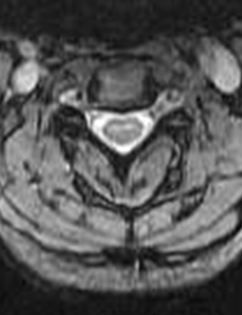 Thoracic Spine: MRI taken at 3.0 mm slice thickness, angled to the disc with STIR and T2 axial views revealed a T4-T5 central protrusion measuring 2 x 4 mm in size in the midline. 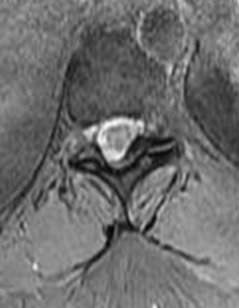 Lumbar Spine: MRI taken at 3.0 mm slice thickness, angled to the disc with STIR and T2 Axial views. L5/S1 demonstrates a central disc herniation with annular tear measuring 3x 6 mm indenting the epidural space and very mildly touching the thecal sac. Cervical spine also demonstrated a C3-C4 disc bulge compressing the thecal sac and deforming the normal shape of the cord by altered CSF pressure. (Fig. 1B) (1). C5-C6 demonstrates a central protrusion with annular tear compressing the ventral cord in the midline by altered CSF pressure. MRI Discussion: After review of the clinical examination findings, the patient’s subjective complaints and the X-ray and MRI imaging studies, the findings were reported to the patient. I subsequently ordered a brain MRI since I did find an adequate explanation of the left sided sensation and motor deficits. 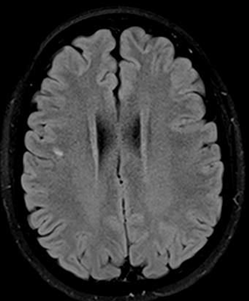 The brain MRI demonstrates a right frontal/parietal subcortical white matter demyelinating lesion in T2/FLAIR images. (Fig 3). Fig. 1B: C3-C4 disc bulge, thecal sac compression, deforming the cord shape and apparent CSF in the central canal of the cord. Fig. 2: T10 left facet arthritis indenting the thecal sac and compressing the left posterolateral cord. Diagnostic Impression: When arriving at a diagnosis all objective findings along with subjective complaints should be considered. When I considered the profound left sided sensory and motor deficits, the clinical findings and the imaging findings I referred the patient to a neurologist for evaluation of late onset multiple sclerosis. (3) The patient consulted the lead Neurologist in the M.S. Department at Shepard Center in Atlanta who confirmed the diagnosis. Therapeutic Focus and Assessment: At the report of findings it was explained to the patient that she did have spinal findings that were treatable and that did contribute to her pain. It was further explained that the care provided is not expected to affect the symptoms that are caused by the M.S. condition. An 8-week course of non-surgical axial decompression was completed, aimed at reduction of the C3-C4, C4-C5, C5-6, L4-L5 and L5-S1 disc displacements. At discharge, the patient reported a 90% reduction of spine pain and improvements of the left sided upper and lower extremity weaknesses. She was discharged into the care of her neurologist at that time. Discussion: Properly trained chiropractors are the perfect fit to be the primary spine care provider. Our education includes extensive training in identifying biomechanical and anatomical lesions of the spine in order to arrive at an accurate diagnosis, prognosis and treatment plan. This includes proper triage to other healthcare providers. In this case the patient presented with a biomechanical issue, disc herniation and degeneration, with facet arthritis, but also with a significant non-spinal pathology that was identified properly and referred appropriately. Numerous other physicians and chiropractors evaluated this patient, all of whom treated the obvious without finding the underlying cause of her numbness and weakness, which may have delayed necessary care. A Doctor of Chiropractic, who is well trained and credentialed as a Primary Spine Care physician knows to look beyond the obvious, taking all findings and patient subjective complaints into consideration in order to obtain a proper diagnosis, prognosis, and appropriate plan of treatment for each patient. 1. Fardon DF, Williams AL, Dohring EJ, Murtagh FR, Gabriel Rothman SL, Sze GK. Nomenclature 2.0 for Disc Pathology, Spine J. 2014 Nov 1;14 (11):2525-45.doi: 10.1016/j.spinee.2014.04.022. Epub 2014 Apr 24. 3. 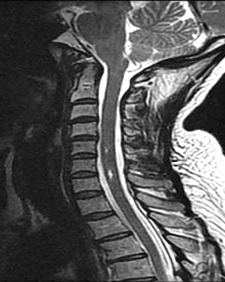 Pillich D, El Refaee E, Mueller JU, Safwat A, Schroeder HWS, Baldauf J. Syringomyelia associated with cervical spondylotic myelopathy causing canal stenosis. A rare association. Neurol Neurochir Pol. 2017 Nov - Dec; 51(6): 471-475. doi: 10.1016/j.pjnns.2017.08.002.Epub 2017 Aug 14.